May 2014. I've got great modular terrain for Warhammer and Warmaster and not for Epic. Modular terrain is great, but it's bound to a scale, needs a lot of storage space and it's flexibility is limited. So I decided not to go the modular way for Epic. So which of the positive aspects would I like to have in the new solution. Scalability: If I only want to shoot a photograph, it would be nice not to lug a 1,20 x 1,80m terrain board around. Different surfaces: A bit of desert, some grass, some city terrain. Preferably in a way so it can be rearranged. Being able to dig - for a river or trench. In addition I would like to have, easy storage, and quick production (if any), looks good. I have a terrain mat from GW, which is really nice and which is a well made product, but which falls short in two of six - not bad, but no cigar. 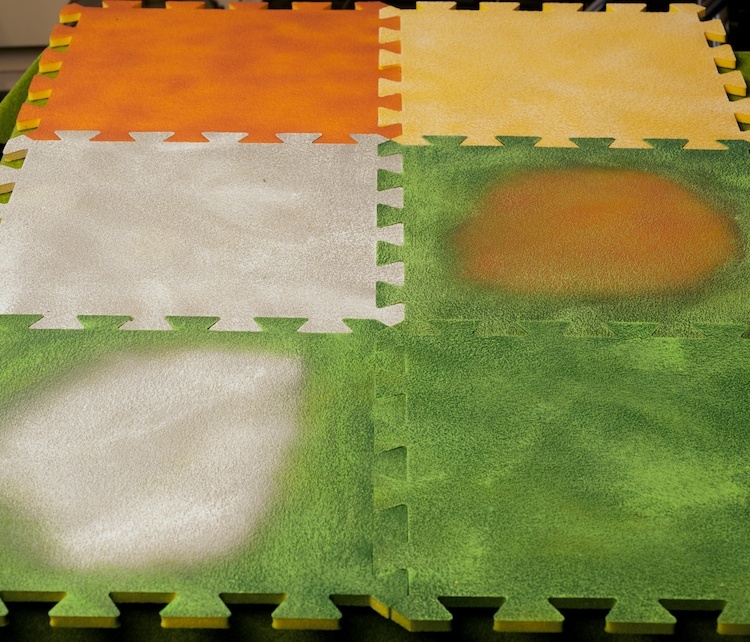 I have a desert - terrain mat which is horrible and expensive and falls short in four of six. Ideal would be some hard-foam preferably and if made from separate pieces those should be interlocking, so that they do not shift and create gaps. To make the story short, I found something very close to that - it's called a puzzle mat. It consists of PE (Polyethylene)-foam tiles about 30cm square which can be combined like puzzle pieces and there are special edge and corner tiles - like the one on the top of the page - so that you get a smooth edge. Price is less than 40€ for 120mx180m. The puzzle mat is meant for small children to play upon, so it's a bit soft, which made me a bit concerned about the flockability of the stuff. It is available in different colors, but the green one I wanted was not in stock. So I ordered a yellow one, which was with hindsight the perfect choice. My original plan was to flock every single piece and I was already planning the creation of masks and templates, so the nooks and crannies would still be usable. But when the tiles arrived, they hadn't a smooth surface as I expected, but a rather pock barbed one - with very small marks, which might just look right if colored and dry brushed. So I went for the simple, but expensive version and bought some spray cans (instead of wall colors), in different colors - namely, green, a tan, a terra-cotta and a gray - to test. And here proofed they yellow base color of the tiles to be a bonus. It plays nicely with all the colors, if it shines through - not that it has to, but if it does, it looks good. I sprayed complete tiles only doing some mixed pieces. I will create some two colored transition tiles later. But for now - that is what the raw tiles look like. Same stuff with some terrain and models for size reference. The big question is: Will it stand the test of time ? The trees transparent bases and the trees have magnets, so that they can make space when need arises. Before I could start to do the variant with the gradients between the colors, I had to buy new spray paint. The DIY I bought the sprays used is about 30 minutes away. So I thought "save some time and go to the DIY more or less around the corner". I was aware that the the sprays would not be as good - because that was the reason why I went to the other store in the first place. "What the heck" I thought, and went to the nearer store. And of course the sprays didn't cover the tiles as well - what a blessing. I liked the look much better and found that I didn't need to dry brush the green areas any more. I didn't manage to get the same effect on the tiles with gray areas. I was either too intend to cover the gray or it was be pollution from those city areas. There is a variant of the mat twice as thick. To my utter disappointment it's not a mat twice as thick but two within mats welted together. 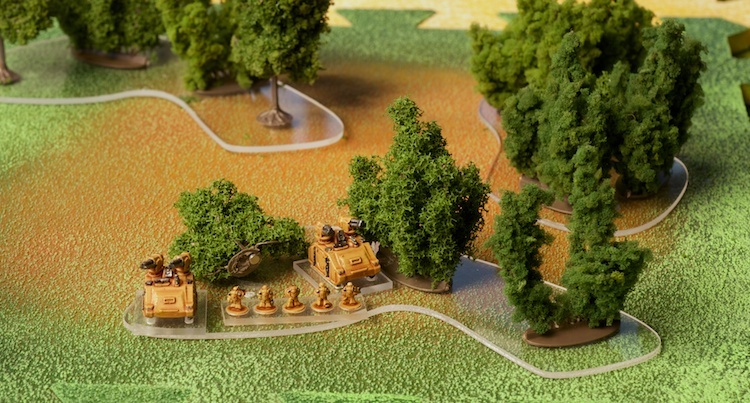 The idea behind getting some thicker mat is to make hills that have the same surface as the table. Because all hills I have are covered in sand or static grass and that just looks "different". Here you can see my first try. It will not be the last, because as you can see, I went back to the "better spray paint" - mainly because I can spray more tiles per can -, but couldn't reproduce the effect. The spray is just covering the tiles too well. !!!! The following images are taken with a wide angle lens, so they are a bit distorted. !!!! 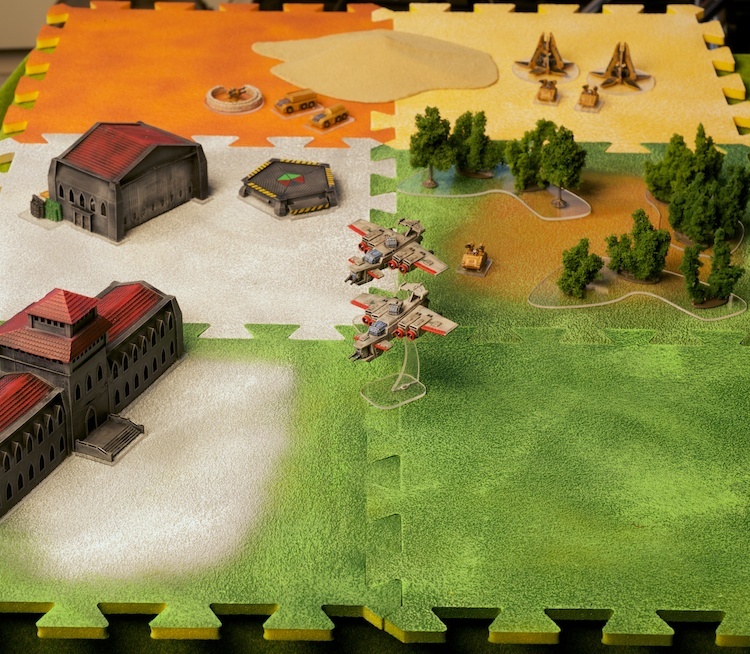 Same table with some terrain on it. The image is larger (still only half the seize of the original photograph). Right-click and open in a different window to have a closer look.